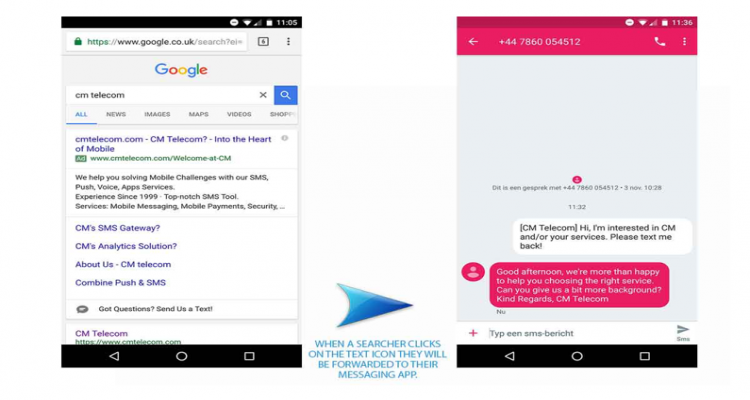 With Google’s Message Extension, the advertiser is able to communicate with the searching consumer via SMS. When the user clicks on the message extension, Google instantly opens his messaging app for him to send a message to the advertiser. This is done directly from the search results, so the consumer can reach you right away without having to go to a landing page and find your contact details. It is even possible to enter a predefined message, making it even easier for the search engine user to reach out to your company. 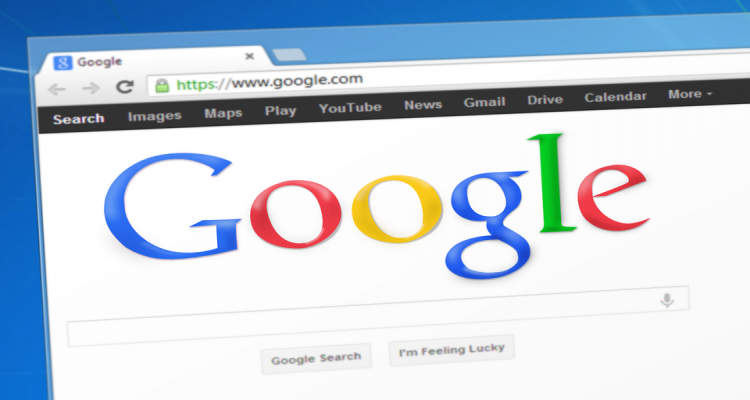 Just like with a click on a Google ad, advertisers pay a cost-per-click when the user clicks the message extension. This means you will also pay this cost-per-click if the user does not send a message. The great benefit of the message extension in comparison to ads without this extension, is that it allows users to get in direct contact with you without having to visit your website. This removes any unnecessary thresholds for you to get in contact with possible new customers. Sounds good, doesn’t it? But what does this message extension look like exactly? This is best demonstrated with an example. Or just try it by taking your mobile phone, going to google.co.uk and typing in the search words ‘CM Telecom’. Click on ‘Got Questions’ and send us a message. Our team will send a response within a few hours. 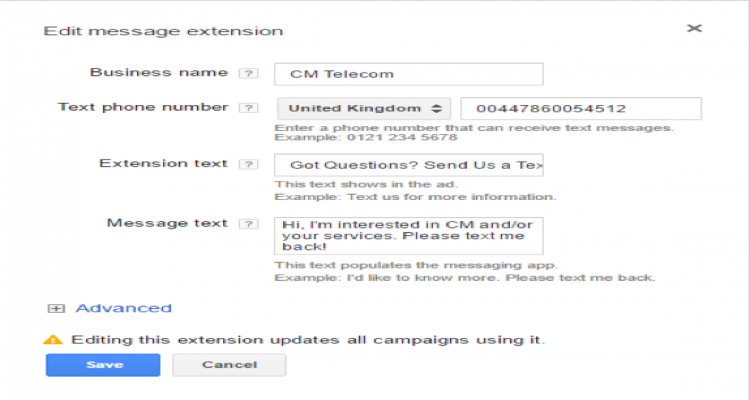 At CM Telecom, we are quite excited about this new message extension of Google Adwords. So, we’ve implemented it right away. Of course, we are more than happy to explain how you can do the same. First things first. You’ll need a mobile phone number on which you can receive the incoming messages. For this, you can use your own number or that of your company. Next, you have to request a ‘long number’ for two-way SMS. CM Telecom can provide you with such a number. If you want worldwide reach, we advise you to use a UK ‘long number’ for your message extension. As soon as you have your dedicated phone number, you can set up the message extension in Google Adwords. You can do this on campaign level, ad group level or account level. Click the campaign to which you want to add the message extension. After opening the campaign, go to the ‘ad extension tab’. Then, select ‘message extension’ and click on the red ‘+extension’ button, followed by the ‘+message extension’ button. In the pop-up that will appear next, you can add your company name, phone number, an extension text as headline and a predefined text message. If you only want your ad extensions to be shown on certain times, for example during office hours, you can set up a schedule at ‘Advanced'. Now, all that’s left to do is click ‘save’ and wait for Google to approve of your extension. This usually takes a few hours. At CM Telecom, we’re excited about the first results of this new extension. We’d love to hear about your first experiences with this extension. Please let us know what you think via Facebook or Twitter. Have you not yet tried the message extension but do you want to start using it as well? Contact CM Telecom and we will help you get started. We will make sure you receive a dedicated long-number so you can use the message extension right away.